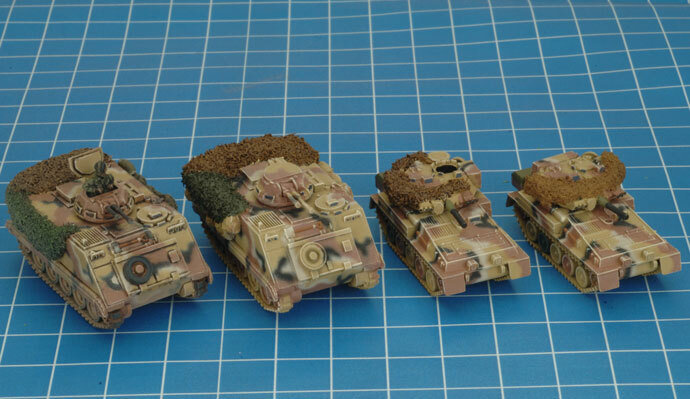 For quite a while now whenever I have posted photos of my models on the Team Yankee Facebook pages, I have been asked about the camouflage nets and how I constructed them. Well, now is the time to find out! 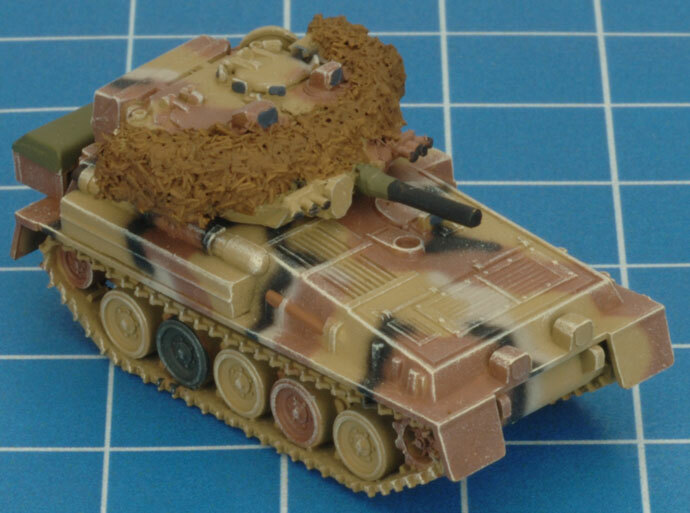 Ever since Team Yankee was released I was trying to find a way to replicate the look of rolls of ‘Barracuda’ type camouflage netting that is very often seen on pictures of modern military vehicles. Full disclosure, the inspiration for my final technique came from our sculptor extraordinaire Evan, and his initial method of achieving this iconic look. 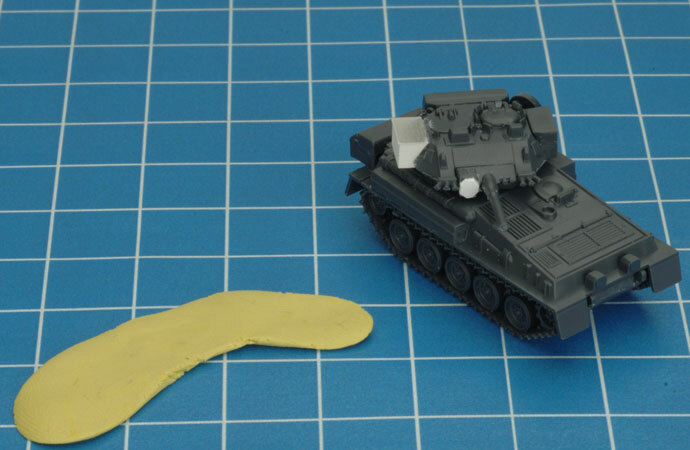 Ready some of your favourite modelling putty. In this case I am using some Miliput, but any product of this type will do. Find the courage deep within yourself to apply modelling putty to a perfectly good model. 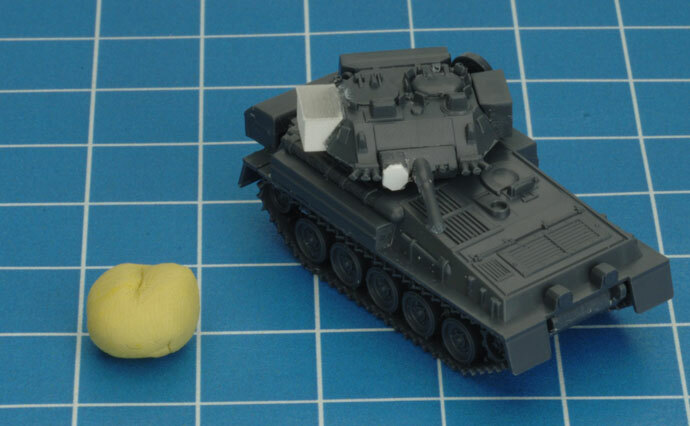 And also shape the putty on your model. This will form the shape of your final camouflage net. 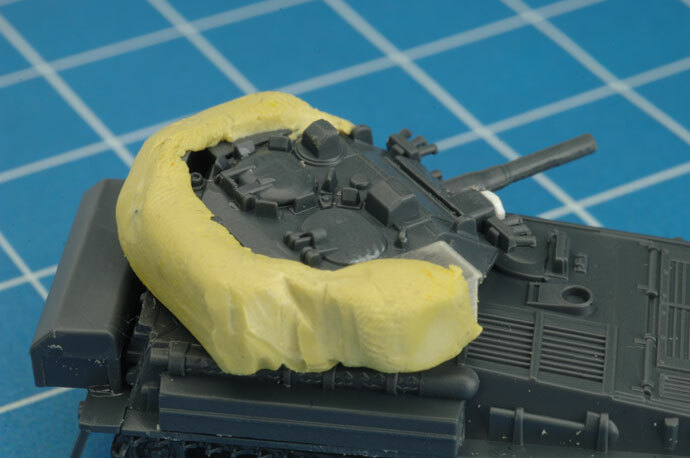 In this case I have chosen to show netting wrapped around part of the turret on a Scorpion light tank. One of the keys to making the netting look realistic is to avoid having it cover things like hatch and optic details. 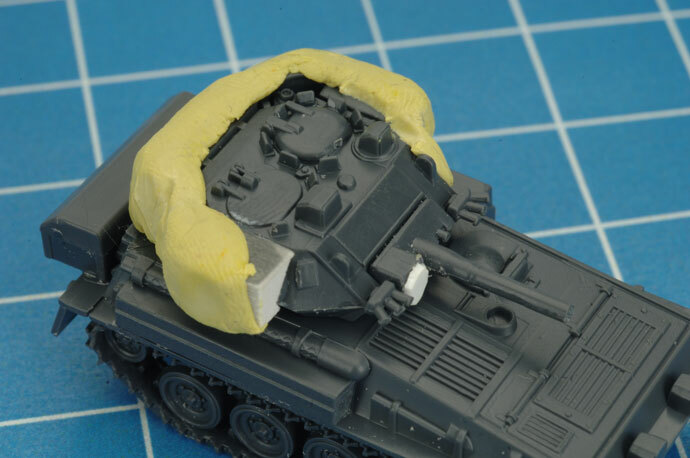 If you want to form a roll of netting instead of a wrap, simply form your putty into a sausage shape and apply it to your model in a place that make sense. Once you are happy with the shape and location of your camouflage net, you then need to coat the shape in white glue. 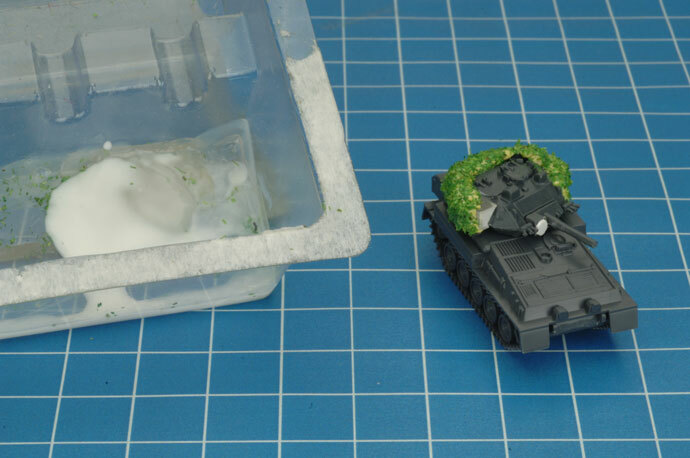 After applying the white glue, your then need to cover the shape in something that will add the texture of the plastic ‘leaves’ that create the distinctive look of Barracuda type netting. 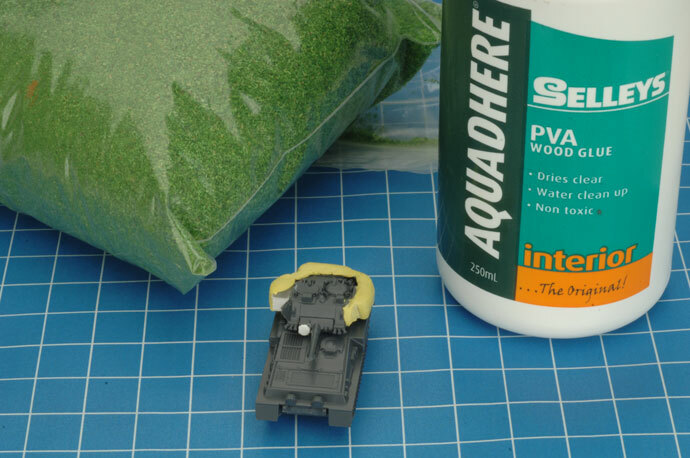 In this case I use some relatively cheap model railway scatter material. This is the last step you need to perform before the net can be painted. Here you need to heavily water down some white glue, and then get an old paintbrush dipped in the mixture, then touch this thinned mix of glue and water to the net until the whole thing is coated. Then leave it to dry, usually overnight is best. This will result in a fairly solid mass that looks like a camouflage net. 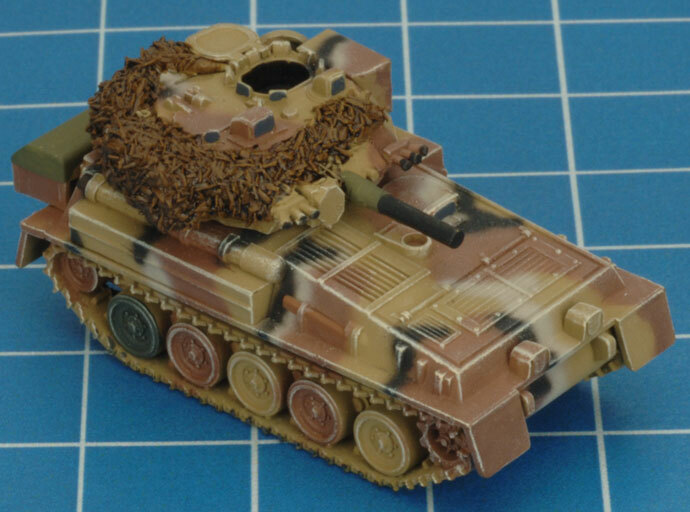 I paint the net after I have applied the basic colour scheme of the vehicle. Barracuda netting is a two-sided material with regards to colour. On one side the net is largely a light earth brown colour, and the other is largely an olive-green colour. 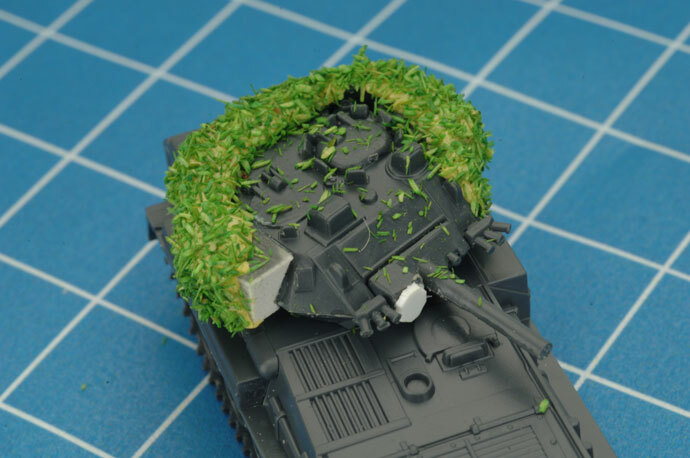 First I paint the vehicle, then I move on to painting the net. I decide whether the net will be green side dominant or brown side dominant, then paint it with the appropriate colour. Once the net’s base colour is dry, I apply a dark wash. The wash will sink into the low surfaces of natural texture of the object, which will give it some depth. The wash will take a while to dry and when it is, I lightly dry brush the original colour back over the shape. This will have the effect of making the majority of the net a lighter colour than the deeper bits that are darkened by the wash, creating a shadowed effect. The final stage I take to paint the net, is to get a more vibrant variant of the original colour and very lightly dry brush this on, taking pains to only get the very ‘highest’ points of the net. This gives the net a good amount of depth which helps cement the look. 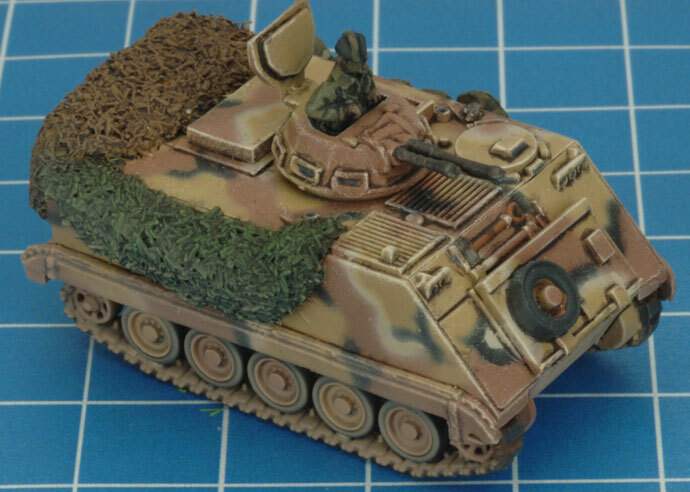 You might have noticed that Aaron's M113 APCs and Scorpion tanks are a bit different (putting aside the camo netting of course). 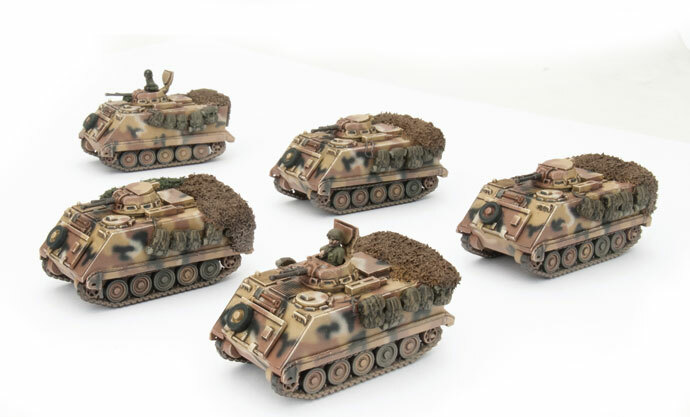 For the Live Launch of Free Nations Aaron decided he would be modeling an ANZAC force with an emphasis on the New Zealand troops. 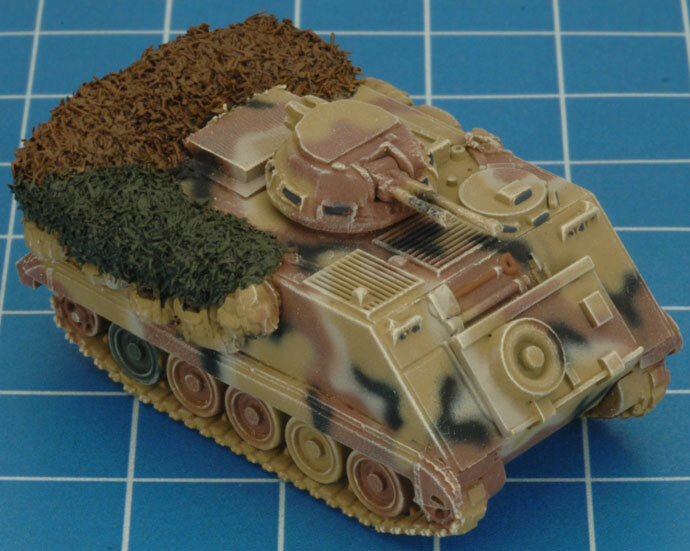 To achieve this Aaron modified the M113 and Scorpion tanks in the same way that the New Zealand Army did in the 1980s. Click the link below to see what these modifications were and how made them. Thanks for your time, and happy hobbying.